Chart4.NET Version 4.1 is released. PDF Export of the organization is available (both in Desktop and ASP.NET applications). Also PDF/Image rendering of the chart is available for ASP.NET version. 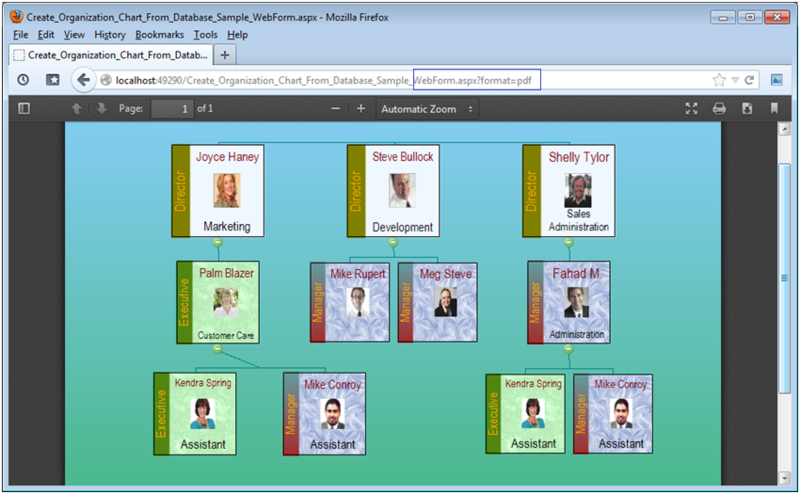 PDF export of organization chart (web and desktop). PDF rendering, download provisioning and customization (ASP.NET). Enumeration & Customization - hpcData has Nodes[Name], Tags[TagName], NodesAll, NodeList properties & NodeByName method. Drawing improvements & Highlight full-path on focusing a node. N.B: 1 - Event settings will override any querystring settings (regarding format,attach). N.B: 2 - You can export the chart to a server file (if required) within the event. You can simply put the query-string like format=jpeg to render the chart in an image format. Other allowed formats are jpeg, gif, png and bmp. You can simply put the query-string like format=pdf&attach=filename to offer the chart to download in PDF/image format. User will get a (Save To prompt) from the browser. Allowed formats are pdf, jpeg, gif, png and bmp. More methods and properties to access chart node's underlying data and settings to customize it after chart is loaded with data. When a node is focused, all the predecessors are highlighted to depict the full path to item. Set hpcSettings.ShowFocusFullPath to enable/disable this feature. Default is true.